When I started working at Delran High School in Burlington County, New Jersey, I thought I was going to be working as a science curriculum supervisor. Within a month of starting this new position, I was told that I would also be working as the Technology Supervisor, which included a course called Do It Yourself. I was told that this class had started working on retrofitting a shipping container into a library for a school in Africa. I asked my Director, “What the heck is a container project?” Seeing is believing, and after my first visit to the SeaBox donated shipping container that measured 40 feet in length, I knew that I had become a project manager. My mind spun. How was I going to pull this off in addition to my other job responsibilities? I had no experience with turning a 9,000 lb. shipping container into a library for children in Uganda, Africa! After my initial disbelief, the mission was clear. I had to build connections to people who cared. Without the human resource, the project couldn’t take flight. Through questioning, the connections were built. Identifying the most important human assets began in August of 2014. The essential players included Pete Miles (DHS Industrial Arts teacher), Jennifer DiCesare (DHS Art teacher), Mr. Kevin Dybalski (DMS Industrial Arts teacher), Brian Stolarick (DHS Assistant Principal), Bart Wear (Director of Homes of Living Hope), Dr. Leonard Herman (Supervisor of the See the Difference One Container Can Make project at Bridgewater-Raritan High School) as well as the Delran Public Schools Support Services staff, the community of Delran and the businesses of South Jersey. Finding that starting place was the path to set the ripples in motion. Mr. Brian Stolarick, the Assistant Principal of DHS made my duties to the container project clear. In 2013, Uganda’s own Francis Nyang, a highly influential Non-Government Organization official, had visited DHS to explain our possible impact on their war-torn nation. Being a history educator and administrator, Mr. Stolarick saw the cross content connections that were possible for our high school students as well as the community and other schools within our district. He inspired me and connected me to the Homes of Living Hope Director, Mr. Bart Wear, for the detail supports that I would need to clarify. Bart became a speed-dial connection. Despite our geographical distance, since he lives in Colorado, he answered my phone calls and emails at all hours of the day, despite the 3 hour time difference. He was pleasant, informative and inspirational at every step of the way. He recommended visiting an existing container project, being completed by Bridgewater Raritan High School to find inspiration in the work of others. I drove 1 ½ hours to northern NJ to see two containers being turned into a medical facility by students and staff at Bridgewater-Raritan High School. Under the unyielding guidance of Dr. Leonard Herman he made the impossible, possible. His idea generation and support was all based on years of experience completing multiple container projects over the years. I remember him saying, “Every little bit helps. You just need to ask. Everyone sees a different way that they can help. You don’t have to do this by yourself.” Leaving Northern New Jersey, I felt invigorated. The ripples were growing, and nothing could stop them now! With school starting soon, the plan needed to be discussed with the some very significant people, the teachers and administrators at our high school and middle school. That preliminary meeting set the expectation for each of us, as to how we would become a part of the plan. Each individual took on a role, with the expectation of completing the container by January 2015. 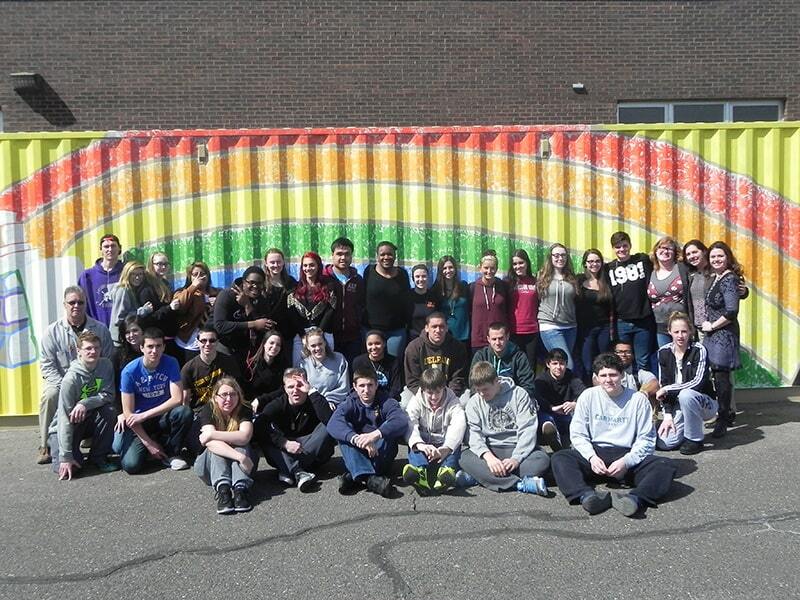 The DHS art teacher, Mrs. DiCesare designed a plan for the exterior of the container. Questions like, “What paints should we use?”, “Can we cover the shipping container labels?”, “How could students develop a theme with our direction and understandings of Ugandan culture and customs be developed for this container?”, “What were the Ugandan people like?” developed the ideas for her art students’ curriculum. Through questioning, we got excited for the possibilities for those lessons. After she created a lesson on the Ugandan people and an explanation of scaling to such a large scale (40’x8’x9’), the students created multiple design ideas for the artistic rendering to come. The wave of ideas grew and grew through the excitement of the teacher and students. FOr example, the Rainbow Race competition harnessed the energy of the entire student body during DHS’s much celebrated Spirit Week competition in October 2014. With the teacher and art students directing the process, 330 students and staff members placed their hands, in paint, on the container in the course of three afternoons. The ripple connected the school through human touch, a value that the Ugandan people find very significant. This simple idea became a beautiful product, and my position was sealed through the experience with so many of Delran High School’s students and staff. 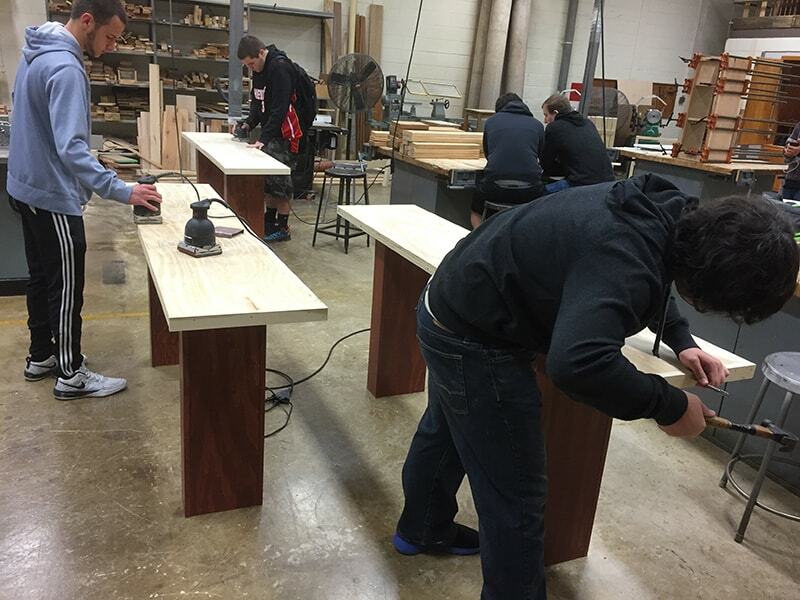 The DHS industrial arts teacher, Pete Miles used his industriousness and skills to work with the woodshop students on the next phase of the project, framing to completion. 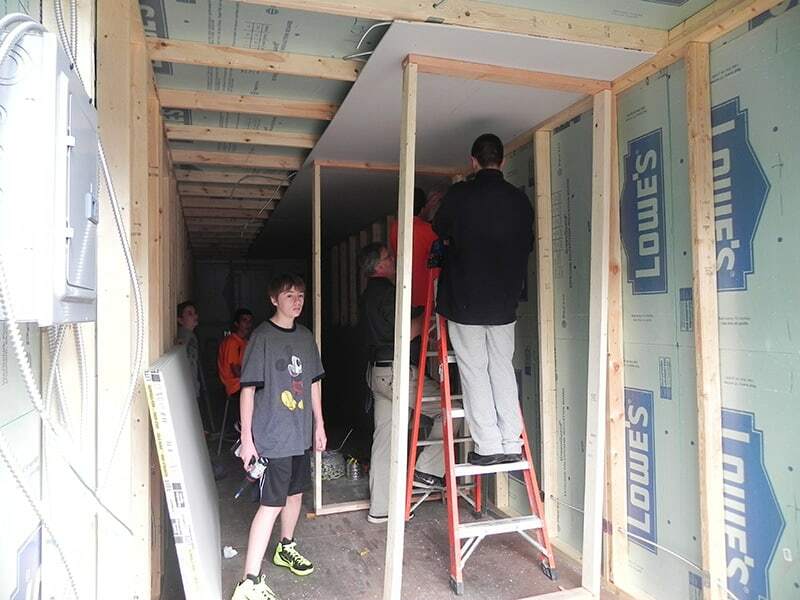 Despite the large class size in the DIY course, the students who got “into it”, really appreciated the skills that Mr. Miles was imparting in them, like design, electrical installation, dry-walling, flooring, carpentry and finish work. The DIY students worked with Mr. Miles as well as our Support Services staff electrician, Mr. Floyd Donaldson to wire the container for power to outlets and lighting receptacles. After wiring, the installation of drywall through the taping and mudding process occurred with the help of our Support Services staff member, Mr. Doug Cutts. The help of our Support Services Staff made students connect to professionals in their trade possible. 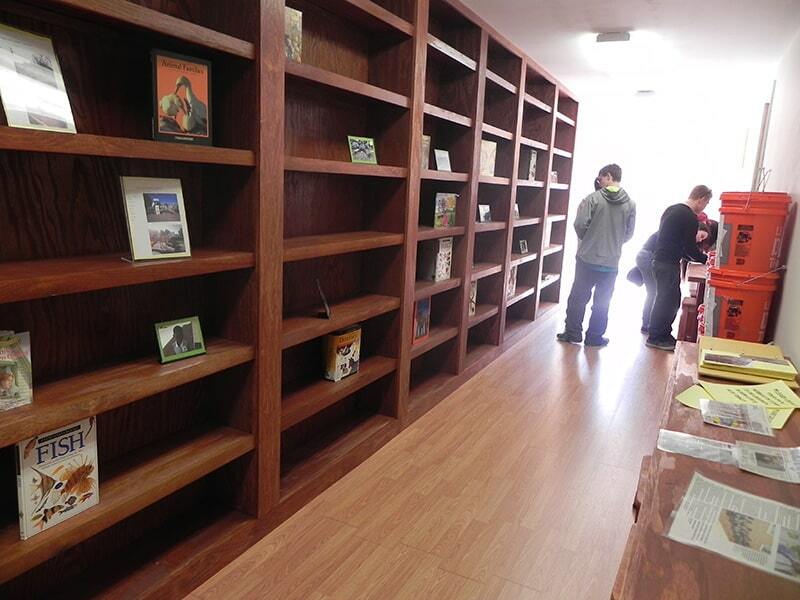 The students worked alongside these men to make every detail perfect, including 30 feet of built in bookshelves, laminated flooring and 6 handmade computer tables. The DMS industrial arts teacher, Kevin Dybalski worked with his students to build the stools for the computer tables. The students lovingly crafted the design of these stools, including dovetail joints by hand. Their craftsmanship demonstrated what time, caring and commitment by energetic youth can contribute. Finally, the teaching staff and community of Delran took center stage during our Buckets of Love drive to collect educational and extracurricular resources. Individual contributors ended up bringing 4,700 individual items weighing 3,635 pounds! Each day as I looked in our collection buckets, my joy grew, as I imagined the images of the Hope Lives Aloi students opening and using these materials. The ripple of generosity was overwhelming throughout the donation process. The most exciting donation came when Bart Wear connected us to the Kids Around the World organization who generously donated 2 playgrounds as well! 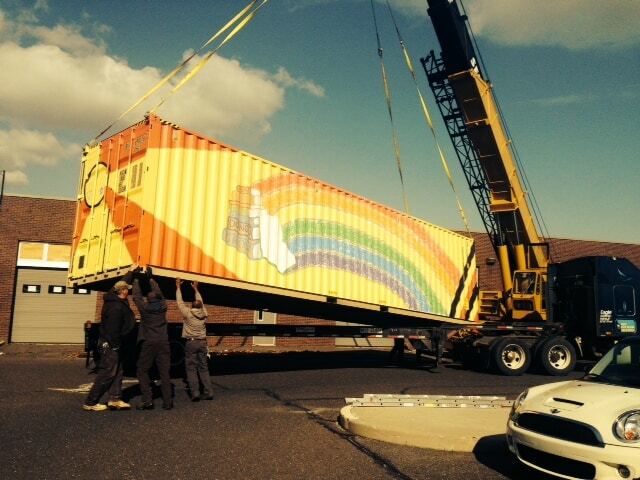 One of my favorite days working in Delran was the day that we packed the container. With the help of our Industrial Arts students and Support Services staff, including Director Mike DiGiovanni, Doug Cutts, Don Lingo, Vince Yezzi, Walter Harris and Don Cook, we stacked, lifted, toiled and navigated the 14,000 lbs of playground equipment and donated goods. We had a blast putting each piece in its place and sealing the doors of this generous gift. On April 23, 2015, a crane came to lift the container onto the back of a semi-truck. Needless to say, DHS celebrated! It just so happened to be Take Your Child to Work Day. Young children, teachers, administrators and support staff came out to see the culmination of 18 months of this experience. We stood in awe of the heavy equipment and process. I watch with pride, reflecting on the last 9 months of this endeavour. The See the Difference One Container Can Make project has changed me forever. I’m just one person in a world of 7.3 billion human beings, but I know that the ripple of connectedness to only a tiny segment of those humans is meaningful. Each of us that contributed matters. One hundred years from now, our individual ripples will have grown into a wave of positive change for the children at Hope Lives Aloi School. May those children prosper from the love of so many ripples emanating from the community of Delran.